Batteries are a common item in the high tech world in which we live. Batteries themselves can be the older, low tech dry cells or alkaline cells to the more modern lithium based ones which include protection circuits and a computer chip that monitors the usage. Note that the terms “battery” and “cell” are often used interchangeably but technically a battery consists of a number of cells. 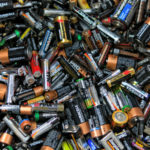 All batteries are able to be recycled. The recovered material may be as high as 97% of the original weight and the value of the recovered material varies from less than $100 per tonne to over $20,000 per tonne. There are a number of environmental and human health and safety issues with batteries. They contain material that is ecotoxic, they can be swallowed by children (mainly the button cells), and they can cause fires or burns. Batteries are sometimes subject to recalls because of possible safety issues, especially the lithium based batteries.